New THINK! road safety campaign launched to help cut child deaths – THINK! New road safety resources released to help teachers and schools highlight the dangers of the road. Road Safety Minister Jesse Norman has launched a new road safety campaign aimed at teachers and schools to help cut child fatalities. A recent survey revealed that 67% of children get fewer than 2 hours of road safety education in their whole time at school and the new THINK! campaign will help schools and teachers highlight the dangers of the road and encourage best practice for children. The government’s iconic THINK! campaigns have helped reduce child road deaths by 90% since records began in 1979. We have some of the safest roads in the world and in the last ten years child road deaths have fallen by more than half. But there is no room for complacency. Teachers are already doing great work but it’s important we in government do everything we can to help teach our children these important safety skills. These new resources should make that easier than ever. The latest THINK! campaign will feature a wide range of brand new education resources, including easy to follow lesson plans, 2 new films co-created with school children and a song in a bid to make teaching road safety lessons easier and more accessible. 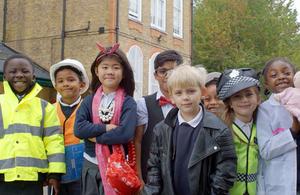 The first documentary-style film follows a group of school children as they act out how to cross the road safely after learning to use the Stop, Look, Listen, Think code. The second film follows another 6 children on their different journeys to school, including walking, cycling and scooting. They explain their top tips for getting to school safely in the form of a new road safety song. THINK! has been running campaigns for more than 50 years and has successfully challenged a number of behaviours and attitudes to improve road safety, including drink driving, drug driving and using handheld phones while driving. THINK! campaigns have helped reduce the number of deaths from 22 a day in 1960 to current levels of 5. These new resources follow a long and a proud tradition of hugely successful child road safety campaigns spanning several generations and featuring much-loved icons such as, the family of Hedgehogs, Kevin Keegan, James Earl Jones (the voice of Darth Vader) and David Prouse as the Green Cross Code Man.